Linda: It was a stormy day last week when eight girls, ages 8-9, climbed inside the airport fire truck. There a fireman entertained and educated the group, pushing the water cannon button blasting 750 gallons a minute in a high arch across the ramp so they could see how it works. This was the culmination of a field trip to the Texas Gulf Coast Regional Airport in Angleton, Brazoria County, Texas that introduced these Girl Scouts to aviation and their local airport. Their Scout leader planned the tour for the week they were out of school for Christmas recess. Mike: Most people’s schedules are full this time of year and no other female pilots in the Houston area were available to join Linda, but in a pinch a male pilot will suffice. My schedule was booked, but Bruce Bohannon, super guy that he is, jumped in at the last minute. After setting and breaking something like 35 world records, and with superior air racing skills proven at the Reno Air Races, it would be easy to become a snob, but that’s not Bruce. He dropped everything to be there for the kids when Linda called for help. Linda: We are fortunate to have such a highly accomplished, youth oriented pilot living in the area. He’s a great promoter of General Aviation, fabulous with kids, and his heart is totally into it. 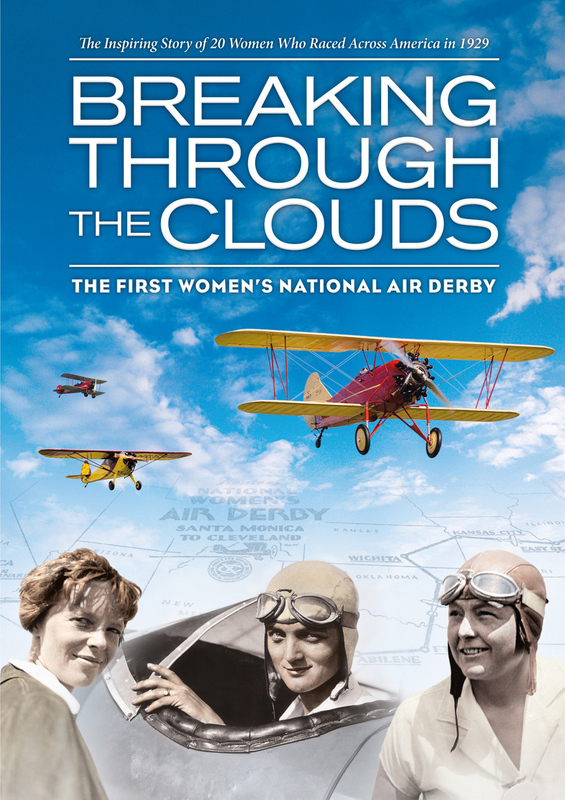 We wanted the girls to think of the possibilities; “the airplane doesn’t know whether you’re a girl or a boy.” Bruce piqued their interest when he said some of the best aerobatic pilots he knows are female. Airport Director, Jeff Bilyeu, fully supported and took part in the event as well. An airport management professional with the highest credentials, Jeff has served in many capacities with the American Association of Airport Executives, and is respected in the industry nationwide. This Girl Scout troop got the best of the best. With a 7,000’ runway and a new restaurant open, the airport has undergone many improvements recently, and more plans to improve services are in the works benefitting the community, the state, and country. Jeff’s involvement in the Girl Scouts’ visit shows his understanding of the importance of the airport director in public and civic events – as it should be. Airport Customer Service Representative, Amy Moyle, started the session by telling the girls about the international women’s organization, The 99s, and introducing me. We talked about airplanes, what makes them fly, and women pilots. The girls were interested in why “airports are for people who don’t fly,” as we explored the products and services that benefit them which rely on General Aviation and local airports. Bruce shared stories of flying adventures, and together, Jeff, Bruce, and I answered many questions the inquisitive girls asked. During the hangar tour the scouts got up close to a King Air, a jet, and a helicopter, and were treated to a look inside the helicopter by one of the pilots. At the beginning of the presentation all but one of the girls had never considered airplanes in their future. Afterward, every hand went up when we asked, “Who thinks they could learn to fly one of these?” For being a rainy, stormy day, it sure was brightened by this event. But a Travel Air sleigh, with nine radial Reindeer! Then I heard "Left at Charlie," and "Taxi to parking. And stopped on the ramp with a "Ho, ho-ho..."
I knew he was eager to be drainin' the sump. Mike: Many kind hearted souls have jumped at the chance to help Courtney Carroll. Prayer, support, encouragement, and assistance have come from people in many industries. A benefit last year in The Woodlands raised money to help offset medical costs not covered by insurance, and as Courtney prepares for her third kidney transplant at Johns Hopkins in Baltimore the costs continue to be incurred, and so does the help. Linda: I was alerted to Courtney’s case when I was “tagged” in a Facebook post by a friend. She had mentioned me to someone named Mari Ann’s, thereby making Mari Ann’s Facebook page accessible to me. I’ve never met Mari Ann, a friend of the Carroll family, who was looking for assistance in finding a medical flight to get Courtney from a Denver hospital to Johns Hopkins in Baltimore. Courtney was too sick to fly commercially. Our mutual friend, Linda Roe, brought me in to the discussion hoping I might have contacts. The Carroll family had already contacted Angel Flights and learned the limitations, such as the 1,000 mile distance limit and the inability to provide service when medical attention is needed during transport. Through the Corporate Angel Network corporations that own airplanes take sick people to hospitals when they have an empty leg going that way but cannot provide medical attention en route. As I was working to find help through my own contacts Mari Ann shared some good news. Footprints in the Sky (from the last line of the poem, “Footprints”, “It was then that I carried you”) a Denver based medical flight company that operates a medically equipped Citation 550 (jet) would take Courtney. The family was asked to try and raise $5,000 for fuel. Before I could even get the word out, one generous person gave the entire $5,000. Mike: Courtney was flown to Baltimore the next day. Dr. Robert Montgomery commended her mother, Tami, who is also her kidney donor, for her efforts and said it's a good thing they arrived when they did. Courtney was in very poor condition. Tami is grateful to God for the direction this has taken, and the expertise of Dr. Montgomery, who has handled similar difficult kidney cases. Right now, they are working to stabilize Courtney and find out why she's losing blood; possibly the rejected kidney, but possibly something else. She will be in the hospital in Maryland for at least two months. Linda: When I shared the update with fellow pilots who had tried to help, one of them, Barbara Harris-Para, asked if there were any other needs the family had. What about a place for Tami to stay? So I sent out a follow-up note to Mari Ann and learned that Tami is staying at the McElderry House across from the hospital, for $700 per month. McElderry House, http://www.mcelderryhouse.com/ phone 410-732-5464. Courtney posted on the National Kidney Center’s Facebook page recently: Hi my name is Courtney and I am a recipient of my father’s kidney. My transplant failed and I’m back on the list. The most wonderful gift someone can give is an organ. This process reminds people of what love really is and I’m thankful to have it because I would not be alive were it not for wonderful people like yourselves. Thank you and God bless. Mike: In Groesbeck Texas, 35 air miles east of Waco, adjacent to historic Old Fort Parker, is a new airfield. Dedicated to antique, vintage, classic and rare aircraft, privately owned Fort Parker Flying Field currently stands 2000’ x 74’ with plans to extend the grass runway to 2,700’. Attendance was higher than expected at the Field’s first fly-in, Old Planes At The Old Fort, held October 1st. The next event, a Christmas Balloon Glow, is this Saturday, December 10. The beauty of it is you don’t have to fly to be a part of it! This weekend, December 10-11, (weather permitting, of course) you are invited to enjoy Christmas At The Old Fort. Linda: Texas history comes to life at this stockade fort that played a unique role in the settlement of our state. A 19th century timeline of entertainers and artisans will demonstrate Texas’ early history, and historic era reproduction Christmas gifts will be available to purchase. The living history timeline will span from the 1820s buck skinners to the 1890s cavalry, soldiers, and cowboy gunfighters. In addition to homestead and camp life demonstrations, artisans will demonstrate glass blowing, blacksmithing, knife making, woodcarving, pioneer cooking, flint knapping, cornhusk doll making, beading, crocheting, spinning, weaving, and soap making. Live entertainment will include Indian pow-wow dancers, gunfighter skits, storytellers, soldiers, dulcimer music, flute music and rendezvous games and skills. New this year will be a Colonial period camp and demonstration of Confederate women’s lives. 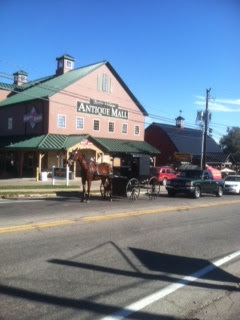 There will also be animals to pet, wagon rides, and of course, Santa. Also new this year is the aforementioned Balloon Glow with tethered rides sponsored by Nadine’s of Groesbeck as well as a fly-in of vintage planes. If you can safely get your airplane on to a 2,000’ strip with 50’ trees on one end, you are welcome. Or just drive in! Mike: Going by air? Darius Farmer is the official Chaos Supervisor and hired killer (usually just gophers, snakes, wild hogs and such, but do not press your luck). If you plan to fly in, call him at 254-747-0592. Pilots: the Field is located 31 33’ 54” North - 96 32’ 46” West, 4.7 nm south of the Mexia-Limestone County Airport, 1.2 nm along the 170 radial of GNL (Groesbeck) VOR, 2.5 nm north of the town of Groesbeck. It’s Bermuda turf (raked and rolled) with 2’x2’ white runway markers each 100’. The 50’ trees are on approach to 17. Normal traffic pattern is on the west side of the runway only. The Flying Field asks pilots to be considerate of residents on the north and east sides. Field elevation is 500’, pattern altitude 1300’ recommended maximum. Use 122.8 (Mexia KLXY), call sign “Old Fort” or “Fort Parker” traffic. Ground-bound? Take Hwy 14 between Mexia and Groesbeck, turn on to Park Road 35 at “Old Fort Restoration” sign. Drive one mile to 866 Park Road 35, Groesbeck, 76642. You can’t really get lost in a town this size. Linda: There will be food booths and lots of shopping opportunities. General admission is $5 adults and $2 children, with modest fees for overnighters and traders/vendors. Camping spots are available, as well as teepee camping, showers, bunkhouse rooms with shower access, a two bedroom house, RV parking with hook-ups, kitchen-dining facility for groups, and wireless internet in Fort headquarters. Contact them at (254)729-5253 or email oldfortparker@aol.com. Linda: The U.S. National aerobatic competition had just wrapped up its week-long activities north of Dallas on a recent Saturday and three-time U.S. National Aerobatic Champion Debby Rihn-Harvey would make Critters Lodge her weekend stopover on her way home to LaPorte. While Debby treated the Lodge guests to an impromptu show in her high performance CAP 232 named “Hurricane,” we were at another fly-in 50 miles away. This was part of our anniversary weekend and we had put two fly-ins on our agenda. Since the fly-in at Critters Lodge spanned the whole weekend, we planned to take part of our Saturday to visit the airstrip right next to Old Fort Parker in Groesbeck. Friday night while socializing with fellow flyers we spread the word about the other fly-in, “Old Planes at the Old Fort.” The Fort was the homestead of the Parker family, whose nine-year old daughter Cynthia Ann was captured by Indians in 1836, adopted by Comanches and married Chief Peta Nocona. Their son, Quanah Parker, became one of the last great Warrior Chiefs of the Comanches, and later became a judge, a businessman and friends with three U.S. Presidents. The Fort’s old cabins and blockhouses are open for exploring, the atmosphere enhanced by the cowboy shooting range, home of the Old Fort Parker Patriots who host a monthly western style shooting competition. “Old Planes at the Old Fort” would only last a few hours and would give folks another destination, another reason to spin those props, and then return to the Lodge for more fly-in/camp-out fun. Many of the guests from the Lodge met us at the Fort. Mike: It was a perfect morning to step back in time and welcome vintage aircraft to the newly completed 2,000 foot grass airstrip christened Fort Parker Flying Field, also the home of the International Bi-plane Association. 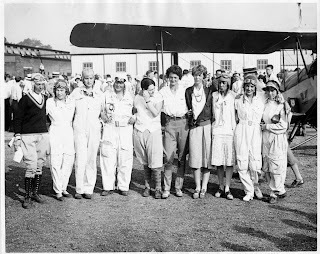 Men and women Patriots dressed in Western period clothing strolled over from their shooting range about a hundred feet away across the road to join others from the community and the gathering of 17 airplanes at the inaugural fly-in. This year’s drought has abused grass runways in Texas. For weeks Airfield Manager Darius Farmer kept the field watered, rolling up and down the runway with a tractor towing a trailer with a big water tank. After watering, he used a roller to knock down gopher holes and then filled in some of the low spots with more dirt making it smoother for airplanes to land. Darius and some volunteers labored all week long getting the field into condition for vintage aircraft. As it turned out, while Debby was wowing the crowd at the Lodge, our friends Jim and Rex, in a Steen Skybolt and Pitts respectively, two open cockpit bi-planes, arrived at Fort Parker in flying formation, with one giving the folks an impromptu airshow of loops and rolls and Cuban Eights. We returned to Critters Lodge in the afternoon, in time for a big dinner in the dining hangar, sunset fly-bys, plenty of great fellowship with fellow aviators, and camped out like everyone else in the tents that spotted the hide-away coves along the runway’s edge. They say New York City has a beat – a heartbeat all its own. These airfields are the kinds of places that are soothing, a salve for the aviator’s soul; hard to leave when the weekend is over. Mike: Having our Cheetah in the paint shop did not dampen our anniversary weekend. Five years of marriage was celebrated at two fly-ins on grass strips. There are many fly-in choices this time of year, but being ground-bound we had to keep the distance short, and it turned out to be one of the best weekends ever. First was the gathering at Critters Lodge near Centerville. Wendell and Beverly Dillard have done a great job of maintaining their 3,100 foot-long turf runway in spite of the severe drought. Unlike many grass strips, theirs wasn’t marked by gaping cracks where one might break a wheel fairing, or worse. That happened recently at the home strip of our friends who rebuilt our engine. Linda was first to notice the front half of the wheel fairing on the left main gear was missing. Turns out, we bumped it on the rough ground on take-off during one of our many test flights testing the timing and engine temperatures. There are a couple of new, more aerodynamic wheel fairings available for our airplane, and given Linda’s need for speed, she almost celebrated upon seeing that one of the old ones was destroyed. Prior to that, our friends’ only concern had been the possibility of losing one of their Chihuahuas in those cracks. But back to Critters Lodge. The Dillards are developing an aviation community. This isn't an airpark in the usual sense. Wendell envisions a place where plane-minded folks can come and enjoy a weekend camping out or staying in one of many cabins he plans to build scattered in the woods about the property. Joined by helpful friends who work like crazy they serve three meals a day during the weekend-long fly-in. Upon our arrival Friday evening we enjoyed a great barbeque dinner while socializing with fellow aviators from Texas, Oklahoma and Louisiana. Breakfast in the big dining hangar was a smorgasbord of every option you could think of – even fresh fruit. Linda: They’re building a really neat place. Saturday evening we hopped aboard one of the many “Mules,” toured the 300-plus acres and found the locations for a future fishing hole, cabin spots tucked away and generously spaced for privacy, and even an area to hit some golf balls. A friend was staying in the first luxury cabin which isn’t quite finished yet. Together the three of us meandered and explored the grounds, imagining how it will look when all that’s planned has been built. Another friend, Jim, recently finished his 13-year project building a beautiful Steen Skybolt, an open cockpit bi-wing. We first saw it at the New Year’s fly-in up in Waco this year, and what a pleasant surprise it was when Jim and his friend Rex, a former fighter pilot flying a Pitts, arrived at Critters Lodge flying in formation and treated us to a couple of low passes. Approaching the grass runway, you can’t tell that all along both sides are areas where the trees have been cut out, making perfect runway campsites with room to park two or three small planes and tents. Campers set up chairs and judge the low passes and landings. Lots of fun to be had and plenty more to tell so check back next week. Till then, blue skies. 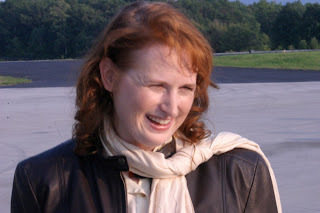 Linda: Last week I started to tell about my recent encounter with making a Pitts S2B biplane dance through the air. Being my first time in this airplane I had to learn how the plane handled and the only way to do so was by wringing it out under the tutelage of my instructor, world record holder Bruce Bohannon. To perform an aileron roll to the left, first establish airspeed –140 knots is good – then pitch the nose up ten degrees above the horizon. Push the stick to the left and as the airplane rolls about halfway through the maneuver, when you’re upside down, push the stick a little forward to keep the nose on the horizon. Continuing the roll through the last half, begin putting in lots of left rudder while pulling the stick back a little. Really step on that left rudder hard through the last 90 degrees of rotation while pulling the nose up, gradually releasing the left rudder as you roll around to wings level flight. It takes a lot of practice to end up pointing the way you intended to. The loops, the half-Cubans, and even the hammerhead turned out more smoothly than most of my rolls, hence, an incentive to return. Mike: Getting into the cockpit of the Pitts requires one to have performed as a contortionist at some point in life. Strapping into the parachute, then the five point harness and the lap belt requires feats of super-human strength. If you don’t get it right it can make for a very uncomfortable feeling, especially when you are upside down, dangling from a loose harness, looking at the earth over your head. The takeoff was a bit bumpy on the drought-stricken grass strip. If this persists, Bruce will have to make arrangements to take his airplanes to a paved airport. The Pitts has tough landing gear but some of those cracks in the ground could cause a prop strike, meaning the potential for a costly engine tear-down. Once we were airborne the Pitts’ powerful engine whisked us skyward to over 3,000 feet where we began maneuvers. I last flew a Pitts over 30 years ago when I was taking aerobatic lessons and somehow my instructor and I ended up in a dogfight with another Pitts out over the Pacific. I’d long since forgotten how light the controls were and how easy it was to over-control and pull a lot of “G’s.” One “G” is equivalent to the gravitational pull we are subjected to while on the earth’s surface. Roller coasters typically subject a body to two or three “G’s” and an aerobatic airplane like the Pitts can subject its occupants to so many G’s they can black out. I didn’t pull that many but the G-meter read nearly six positive and a bit over one negative. My very first roll was so quick and over controlled that we practically slammed our heads against the canopy; oops! After several maneuvers we descended back toward Bruce’s strip. He rolled into a bank with enough rudder to make it feel like we were flying sideways in a steep slipping approach past the power lines on one side and the trees and ditch on the other and deftly touched down on the grass. Our teeth rattled as the plane decelerated and came to a stop right in front of his hangar. I’ll be back. Linda: The FAA Safety Seminar scheduled for October 29 must be one of the most popular offered through “WINGS,” a voluntary continuing education program for pilots. Credits are accumulated by attending approved programs and logging certain types of training. Hot off the press came the invitation to join aerobatic champions and world record holders Debby Rihn-Harvey, Joy Bowden, Bruce Bohannon and John Dunbar for a day of spin training. The seminar would be held at “Flyin’ Tiger,” Bruce’s airport south of Houston. Lunch provided. Seminar free. Arrange flights individually with one of the host instructor pilots. A spin is a stalled aircraft spiraling down. With proper training pilots learn to recognize when they are about to enter a spin, and procedures to recover from this abnormal situation. It is required training for all flight instructors and many believe it should be required of all pilots. I hadn’t flown with Bruce before but several of our friends have, although I’d flown right over his turf strips–a turn point in the Galveston Air Rally earlier this year. I’d seen his highly modified RV-4 about five years ago at the Reklaw fly-in – the RV that holds all altitude and “time-to-climb” records save one. Bruce holds 35 speed and altitude world records, and his experience includes many races won at Reno. For this spin training seminar he was offering time in a Pitts S2B, a two-place tandem bi-wing airplane. It had been too long since my last acro fix so I quickly shot Bruce an email: “Put me down for one of those slots!” But the next morning I had one of those “OY!” moments, the kind where you’d kick yourself in the head if you could. What was I thinking! The fourth annual Tennessee Valley air race, speed dash, and punkin’ chunkin’ contest is October 29th! Even if we weren’t racing, competing with other race nuts to see who can splat a pumpkin on a port-a-potty is totally worth the trip! As quickly as the realization about the scheduling conflict had set in, the Plan “B” solution came just as fast. I would just call Bruce and re-schedule – tomorrow! Why wait till October 29? I felt like I had a pretty good handle on the basics the last time I did any aerobatic maneuvers, but the last couple of times was in a Super Decathlon, a very different airplane than the Pitts. Still, recovery from a spin is basically the same: full rudder deflection in the opposite direction of the spin, push the nose down, and reduce the power. Parachute strapped on, me strapped in we cinched every belt until they wouldn’t cinch anymore. Bruce hopped in, closed the canopy, and we taxied down the dry ground to the end of the runway. A little “systems check” we call a run-up, and off we went. This runway is 2,300’, the longer of the two, and we were in the air about halfway down. All 260 horses galloped the little red and white bi-wing up over the trees and up, up, up to the blue sky. The few puffy cumulus were well above us so we climbed to 3,000’ and I began to become familiar with the flying characteristics of the Pitts. Check in next week for the roll-by-roll of my inaugural Pitts flight, and Mike’s long awaited return to a Pitts. Till then, blue skies. ﻿Linda: Lancaster, 20 minutes from downtown Dallas, is home to a busy community airport. The International Aerobatic Club has contests there and this spring the locals hosted their first air race. It’s also home to the DFW Wing of the Commemorative Air Force (CAF). This Saturday, September 3, you’re all invited to the Lancaster airport for the annual Warbirds on Parade. This year promises to be even bigger and better; just ask Charlie Wood, a man in the know. 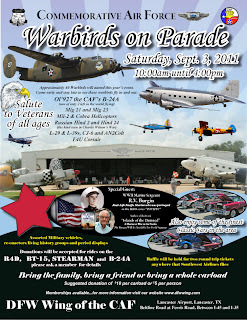 Come see WW11 Bombers, Fighters, Cargoes, Trainers, L-Birds, Communist Mig 21, 23, Hind 24, Hind 2 Helicopters, L-39's, L-29's, “and a few surprises.” There will be nearly 100 classic cars, along with military vehicle and equipment displays. Re-enactors and living history groups will take you back in time - they’ll have their communication gear and may be calling in air strikes - let the kids come and see that cell phones haven’t always been in existence. And don't miss the restored farm tractors and tractor pull, and the “Hit & Miss Engine Display.” WW11 Marine Veteran, R.V Burgin, author of "Island of the Damned" will be selling and autographing his book. His character appeared in episodes 5,6,7,8,9,10, of the HBO series, "The Pacific." They’d like a donation of $10 per car or $5 per person because it costs a lot to keep this show running. ﻿ ﻿﻿Mike: The 8,000 member CAF boasts ownership of 160 WWII airplanes, seen by at least 10 million people a year. “We give them a history lesson and these are the tools,” Charlie says. Mike: Just the little unpainted Grumman Cheetah and me, winging our way back from Indianapolis following The Indy Air Race; she may be an ugly duckling now, but after a new paint job, er, make-over, she will be stunning. The large storms we encountered en route were circumnavigatable, and when the Elyminator began to feel thirsty, she brought me to a small airport in Newport, Arkansas. Her thirst quenched, I saddled back up and we climbed out past Little Rock, contacting approach control for traffic advisories on the way into Houston. Passing east of Shreveport well above the haze layer the sun was setting, reflecting a host of hues through the prisms of raindrops and ice crystals in the lower layers of the clouds to the west. An intricate symphony for the eyes, a vast gourmet setting so awe inspiring one can’t help but want to share it. Alas, photos from a cell phone camera can’t convey what my eyes soaked in. That beautiful view of colors suspended in the atmosphere is reserved for those who escape the bonds of gravity, separated from the ground by a mile or more of air molecules, as we were, the Elyminator and I. From wheels up at Indianapolis Executive Airport to wheels down at Ellington Field, total time to travel, including the fuel stop, was accomplished in seven hours. Not only did I marvel at the scenery, I was also not inconvenienced with having to go through a security line and being subjected to a head-to-toe search for whatever they look for. I simply loaded up, climbed in, and blasted off. Even with the high price of fuel these days, the bottom line comes out about the same as a round trip airline ticket–without the hassle and with the wondrous exhibition of God’s pageantry of color. To make the same trip by airliner would require arrival at the main airport at least an hour before departure, with likely one or two leg transfers at Chicago, Atlanta or somewhere. Add to that the time it takes for the rigmarole of checking bags and picking them up at baggage claim at the other end; one could easily spend more time journeying by airline than I did flying myself. The only direct flight offered by one airline cost more than I paid in fuel and with it I would still have had to endure the federal government’s impositions on airline passengers. Linda: And, it sure beats driving. The race in Indy went very well, especially for a first-time race, and in spite of a first-time race director. More on that another day. Until then, blue skies. Linda: At the center of the city of Indianapolis the road forms a circle, Monument Circle, where four downtown streets provide access to make the round-about drive. In the center is a war memorial monument, and around the perimeter are a fancy restaurant, hotel, some high rise business offices, and, of course, a Starbucks. Emmitt Broadcasting takes up a fair piece of Circle real estate, including four radio stations and a magazine. It kind of reminded me of the TV stations in New York, where folks walking the circle can listen to the live broadcast and see inside through the ground level windows into the studios of WIBC Radio, the largest station in Central Indiana. The popular evening radio host, Denny Smith, invited me to join him on his show the Wednesday before The Indy Air Race, to talk about the excitement of air racing – something new to the auto racing capital of the world. After we finished the show, my sister, niece and nephew and I went to grab coffee drinks. Enjoying the cool evening temperatures, chatting about airplanes and radio and other fun things, we noticed a group of high school aged kids go into the coffee shop. All but one, that is. One young man stood outside, and then turned to my nephew and asked him to clap twice. Good thing he did. It turns out the game was that the boy couldn’t go inside with his friends until he could get someone to clap. Twice. That silly little game opened the door to conversation. We noticed one young man was carrying a trumpet, so we asked what they were doing, where they were from. The really nice group of kids said they were from Texas and were there to compete in a world drum corps competition. I soon discovered they were from the San Antonio and San Marcos areas. One young man had worn his shoes out so much they had come apart at the seams, at least the full front half of them. These kids had to come up with $1,800 each for this trip. We talked about where they’d been, the competitions, and the fun they’re having, when one of them mentioned Hardin, Texas. Two things these kids said stood out about being in Hardin in July this year. One was the sweltering heat. The other was the generous spirit of the people. As these youngsters had to earn their own way to the competition, they became impressed with the people of Hardin, who, they told us, had purchased so many t-shirts and other items from them and donated more money so that little Hardin, Texas became the one place that has supported their group more than any other place they’ve been. Two important lessons in meeting these kids are that it’s a small world, and that a reputation can go far and wide, whether it is a person, a school, a sports team, a business, or a community. These were pleasant, friendly, polite teenagers, who were fun to visit with, and who spoke highly of one generous small town in Liberty County, Texas, that will remain in their memories for years to come. Mike: Saturday August 13 will witness “The Indy Air Race,” a new event in Indiana. Airplanes will test their metal against the clock as they course their way around six turn points through Central Indiana on a cross-country course of 144.5 nautical miles. So far, eighteen airplanes are registered for this weekend’s event. Traditionally, several entries come in days prior to any race as pilots nail down their personal schedules and check weather forecasts closer to race day. If all goes well this will also be the first time our Cheetah has raced since we began our engine overhaul and aerodynamic upgrades several months ago. It still needs a paint job but thanks to our mechanical genius friend and rescuer in Crandall, Texas, it will be ready to race. Someday we may write about the challenges we’ve encountered along the way but for now, we are happy to be airborne once again. Linda: Hosting an air race in Indy was an idea born out of conversations Mike and I had when the Chief of the Sport Air Racing League, Mike Thompson, said he would like to see the League grow to areas where air racing hasn’t been yet. Indy, my hometown, was at the top of our short list of airports that meet certain requirements for hosting an air race. Last year at a race in the Tennessee Valley, the Chief and I discussed the idea of a race in Indy. Liking the idea he wondered if we could organize a race long distance. I felt it was possible because I have lots of family and friends (volunteers) there. A few phone calls later and great help from my mom and sister, somehow it all came together. Among the airplanes entered are several really fast Experimental/Homebuilt aircraft. Lynn Farnsworth, a Reno air racer and war hero will lead the pack at the start in his souped-up Lancair Legacy. We’ll be on the air on WIBC radio in Indianapolis either Wednesday or Thursday evening at 6:00pm Central time, streaming live at www.WIBC.com. The host, Denny Smith, who is also a pilot, was so excited when he received an email from my sister regarding the race that he immediately scheduled us for his show – great promotion for the race, and for the League. My sister’s hosting the pre-race party Friday night, where there will be plenty of food, socializing, and fun. A shooting range is on the property and I just ordered a large inflatable outdoor movie screen. The air race movies I bought should go over very well with this crowd. The racers and volunteers will take a special tour of the Indianapolis Motor Speedway the day before the race, and on race day when the airplanes enter the runway to start their take-off roll, they will be given the green flag by veteran Indy 500 race driver Bob Harkey, himself a pilot. The hosting FBO, Montgomery Aviation, will serve a pancake breakfast and hot dogs after the race, and has discounted their fuel price for our racers. The Montgomerys have also pitched in as sponsors toward the cost of t-shirts and trophies, to supplement our main sponsor, Aerodine Composites, who has been quite generous in support of our race. As a first-time Race Director, I’m indebted to a great bunch of volunteers, sponsors, and hosts, and am excitedly looking forward to Saturday’s race. Mike: On the dusty, dry western edge of the Texas Hill Country sits the city of Menard, and a significant place of Texas history, the Spanish Presidio San Sabá. Built in 1757, the presidio served a three-fold purpose: to protect the nearby Mission Santa Cruz de San Sabá, to find the silver they’d heard about, and to guard the Spanish frontier. The Presidio is one of nine forts along the Texas Forts Trail, a recommended driving trail. During a Liberty-Dayton Chamber luncheon we explained to local business folks how valuable our airport is and inventive ways it can be used to bring people to town. Similar to our suggestions about advertising events in Liberty as fly-in destinations, like-minded advocates in Menard posted this: “Wing your way to the Frontier Fly-In, to Menard, Texas to see the restoration of the Spanish Presidio San Saba in progress.” Great marketing for the town, the restoration project, and the airport! Mike: The presidio, located 300 yards south of Menard County Airport, was at the time of its occupation the only Spanish stronghold on an otherwise unoccupied frontier. It was the largest and most important military installation in Texas at that time, home to more than 300 Spanish soldiers and civilians. Some call it "the ruin of ruins." Elizabeth Cooper wrote, “The story of Presidio San Sabá is the story of Texas,” and invites readers to imagine soldiers practicing drills in the courtyard while herders tend cattle and farmers work nearby fields, to catch a whiff of fresh-baked bread and meat roasting on a spit, or hear children playing in the courtyard. Those involved in the present restoration project are offering free transportation to fly-ins, inviting you to call (325-456-5994) for a private guided tour, observe the ruins as they are restored to original beauty, and see the authentic Jim “Bouie” signature carved in stone. Their fly-in invitation boasts of excellent area restaurants and sounds just downright friendly. It’s a superb example of what we encourage Liberty area businesses to do: make good use of your community airport; it’s an asset. 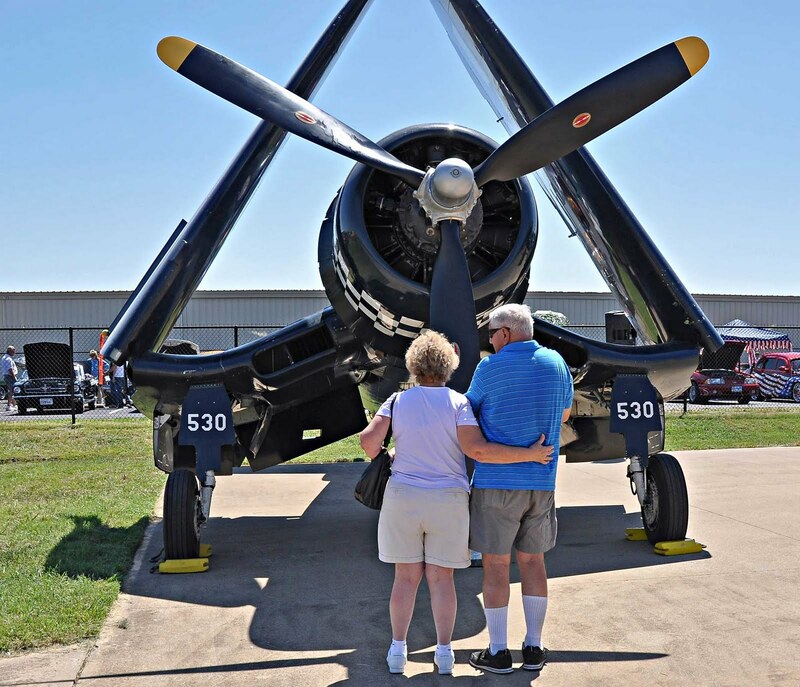 Linda: Another Texas history fly-in is “Flights of Our Fathers Fly-In” sponsored by the British Flying Training School Museum at Terrell Municipal Airport, September 16-18. I was there in June for an air race and can say, that museum is well worth the trip. In this year’s theme a salute to veterans honors the valor of our fallen heroes, including the ultimate sacrifice of five men from Terrell. The weekend events occur within a reunion of the men who were trained there. On September 16 there’s a hanger/dinner dance. 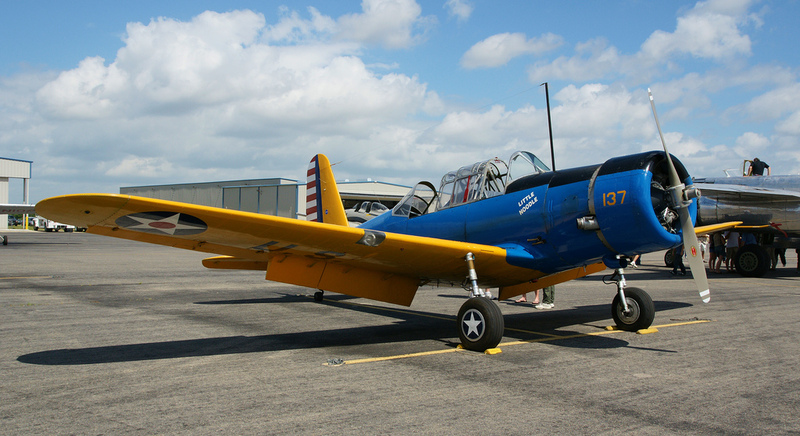 September 17 is the fly-in with talks by Tom Killebrew, author of “The Royal Air Force in Texas,” and Dr. Calvin Spann, WWII Tuskegee Airman, static displays, and plane rides. The weekend will conclude with a Memorial Service September 18. Open to the public, drive-ins encouraged. Contact Beverly Mardis 972-524-1714, or bmardis@bftsmuseum.org. Their website: http://www.bftsmuseum.org. Linda: Seagulls and pelicans crisscross and dive for fish in the Intercoastal Waterway until, suddenly, tranquility is ripped apart as a flash of light, eardrum-shattering blast, and earth shaking vibrations reverberate from 8.8 million pounds of thrust rocketing the Space Shuttle Atlantis into orbit at 17,500 mph. The thunder continues until the shuttle disappears from sight and all that is left is the dissipating plume of smoke, and wonderment and tears in the eyes that witnessed this final ascent. Mike: Thursday, July 21, 2011 was an historical day. Space Shuttle Atlantis touched down at Kennedy Space Center in Florida ending a 13 day resupply mission to the International Space Station. Sadly this ended more than an era. There will be no more space flights for the orbiter. Once all the dangerous fluids are removed and it is somewhat cleaned up, Atlantis will remain at Kennedy on public display. Space Shuttle Endeavour will be on display in the California Science Center in Los Angeles, not far from where she was created. The Space Shuttles were built by Rockwell International in Downey, California with final assembly in Palmdale, near Edwards Air Force Base. Space Shuttle Discovery, the only surviving original shuttle to go into space will replace the Space Shuttle Enterprise, the orbiter prototype which never actually went into space, at the Smithsonian Air & Space Museum in Washington D.C.
Space Shuttle Enterprise will be moved from Washington D.C. to New York City’s floating aircraft carrier museum, the USS Intrepid, the recovery ship for Aurora-7 and Gemini-3 space flight missions back in 1963 and 1965 respectively. New York claims the Enterprise once flew over the city in 1983 while conducting upper atmospheric tests. At Johnson Space Center in Houston, no Orbiters will be placed on display and the shuttle simulators and associated equipment are to be divvied out to other museums across the country. In what seems a direct slap, two seats from one of the earlier Space Shuttle missions are the only items to remain for display in Houston – Space City. Linda: This makes 135 Space Shuttle missions over the past 30 years, Atlantis having flown 32 of them. While the 12 year project to assemble the components of the International Space Station is currently the most visible achievement of the shuttle program, there have been a multitude of others, less visible. We’ve benefitted from the technology developed out of the program with over 100 different technical advances. From the development of light weight fuel pumps came a light weight (less than 4 ounces) heart pump in use today. From the leak detection system developed for the shuttle, a commercially viable vehicle was developed with natural gas as its fuel. Fly-By-Wire and Drive-By-Wire technology used in today’s vehicles decreasing weight and increasing fuel efficiency came directly from the shuttle program. And don’t forget the Hubble Telescope and the 180 other satellites launched into orbit from the shuttles. Linda: There’s so much going on in the aviation industry that sometimes choosing a topic to share here can be difficult, but I read a story recently about a priest who has earned a big award. Mel Hemann and two of his three brothers are priests. All four of the Hemann men are pilots: Mel, John, Everett, and Matt. Last week Melvin received the prestigious Wright Brothers Master Pilot award for over 50 years of safe piloting. Mel is 82 and from a little Iowa town called Stacyville, where he and his brothers grew up on a farm – with a landing strip. Flying is second to his faith, but it’s a passionate second. This award also earns him recognition in the FAA’s Roll of Honor in Washington, D.C.
And here’s something I learned: there is an association just for flying priests! The association of flying farmers we wrote about a few weeks ago is no surprise, after all, crop dusters have been around since the early days of flight. One of the Hemann brothers, Matt, is a flying farmer. And there are associations of flying physicians and flying musicians. But flying priests? Yep, sure enough, it’s called the National Association of Priest Pilots (NAPP), and their 48th annual meeting was held last week in Mason City, Iowa. And that’s how and where they surprised Melvin with the award. It totally makes sense. They’re mission pilots, they’re businessmen using business aircraft – for the business of Church. Mel Hemann told the reporter from KIMT television in Mason City, Iowa that, "if Jesus was living today he'd use TV, he'd use radio, and the internet, and if he wanted to go somewhere he'd use a car or a plane, so it's trying to incorporate a thing that's not only a hobby but also it's something that can be very practical in doing what we're called to do." Linda: The press release from Washington hit my inbox a few days ago heralding the 75th anniversary of federal air traffic control. Our nation's Air Traffic Control system has grown from just three air traffic control centers, housing a total of 15 workers in 1936 to 313 federally operated air traffic control facilities housing more than 15,000 workers. There are also control towers staffed by contract employees. Conroe is one example. Those 15 original employees worked in Newark, Chicago, and Cleveland. Looking back at how air traffic control first operated underscores the tremendous advancements made in safety, speed, and economy. Controllers back then took radio position reports from pilots to plot the progress of each flight. They were not yet providing separation services (separation between airplanes). In fact, they didn’t even speak directly to the pilots flying the airplanes. At the time, the fastest plane in the commercial fleet was the Douglas DC-3, which could fly coast-to-coast in about 17 hours carrying 21 passengers. Today’s air traffic controllers not only provide separation services but do so for an average of 50,000 flights per day. 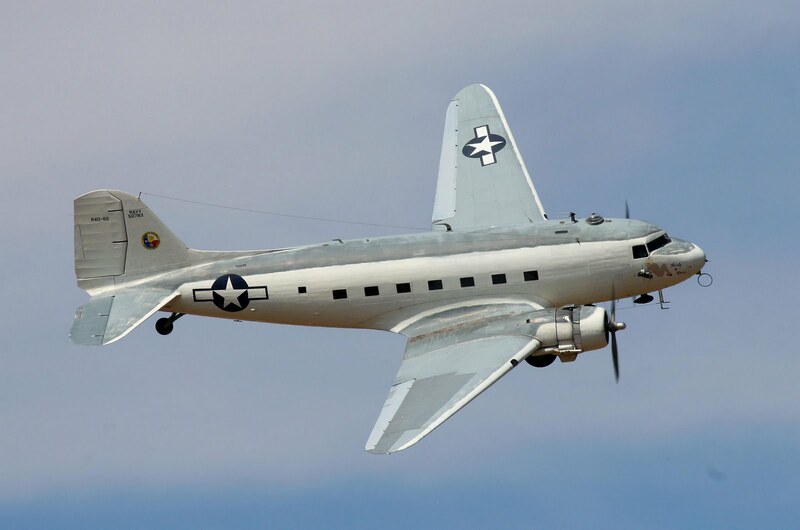 The DC-3 can comfortably claim its place in history. One of my all-time favorites, it is a real work horse and deserves respect as a great airplane. But speed up we have, and today’s jet airliners can carry hundreds of passengers and fly from Los Angeles to New York in about five hours, improving efficiency (as long as you don’t count the time it takes to get to the airport, park, stand in line and be accosted by the TSA). Apparently a little more direction was needed. Procedures to control local air traffic began in 1929 at an airport in St. Louis, Missouri. A person would stand at the end of the runway using colored flags to communicate advisories to pilots. Flags were replaced by light guns, which are still required to be available for use in control towers today in the event of radio failure. As aircraft were fitted for radio communication, airport traffic control towers began replacing the flagmen with radio operators. In 1930, the first radio-equipped control tower in the United States began operating at the Cleveland, Ohio Municipal Airport. Within the next five years about 20 radio control towers were in use and almost all airline aircraft had radio-telephone communication, although direct communication between pilots and controllers was still to come. En route airline crews communicated via radio with their company dispatchers who would in turn call the air traffic controllers, who tracked the position of planes using maps and blackboards and little boat-shaped weights. From flagmen on the ground to GPS satellites in the sky, we’ve come a long way making air travel safer, faster, and more affordable.